San Mateo Commercial Cannabis Bond • Surety One, Inc. When the California passed the Medicinal and Adult-Use Cannabis Regulation and Safety Act (MAUCRSA), the chapter did not include any preemption statutes that would restrict counties and municipalities from regulating cannabis cultivation, processing and distribution activities within their respective local jurisdictions. At the close of 2017, the County of San Mateo enacted a county ordinance that placed licensing requirements and restrictions on the types of operation that would be allowed. A San Mateo County commercial cannabis bond is one of the myriad of requirements that potential operators must plan for when contemplating a new cannabis operation. Per San Mateo's Planning Division, the "Board of Supervisors approved an ordinance allowing mixed-light (greenhouse) cannabis cultivation, including nursery cultivation, in the unincorporated areas. The Board also prohibited for another year the issuance of any other commercial cannabis licenses, such as retail sales. In addition, the Board extended the prohibition on personal outdoor cultivation on the grounds of a private residence. The County will only issue licenses in areas designated "agriculture" by the County General Plan or on land with documented agricultural use for at least three prior years." To facilitate identification of those areas where cannabis may be cultivated the County provides a map which you may review here. The San Mateo County cannabis bond must be issued in an amount not less than thirty five thousand dollars ($35,000). Currently no template is available from the County however those license/permit surety bond forms approved by the California Attorney General appear to contain language satisfactory to the County. Questions about the application process and related forms can be directed to CannabisInfo@smcgov.org. You may access the County's cannabis licensing page here. 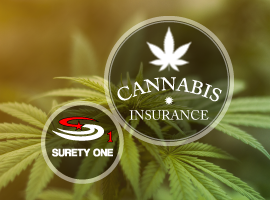 California surety bond leader, SuretyOne.com is the premier underwriter of the surety bonds needed by both the recreational and medical cannabis sectors. We firmly believe in supporting the availability of these products to patients that benefit from them and will provide bonding to ethical cultivators of cannabis products where permitted by law. We will consider applications for a San Mateo commercial cannabis bond bond for start-up businesses, individuals and legacy cooperatives regardless of credit or financial statement condition. For further information contact us at (800) 373-2804, email Underwriting@SuretyOne.com or click here for a live chat.